The sun is shining over the city today in all its splendor, just as Alexander the Great must have brought light to the city he founded 2,000 years ago. The city is almost sparkling. A brisk, chilly wind is whipping frothy little waves in the sea. It's so much easier to imagine this as a beautiful city a couple thousand years ago, even a few decades ago, than it is now, as I try to see past the grimy buildings. But, if you stand a bit away from some of the buildings along the shoreline, the city is luminescent. This is a magnificent bay. 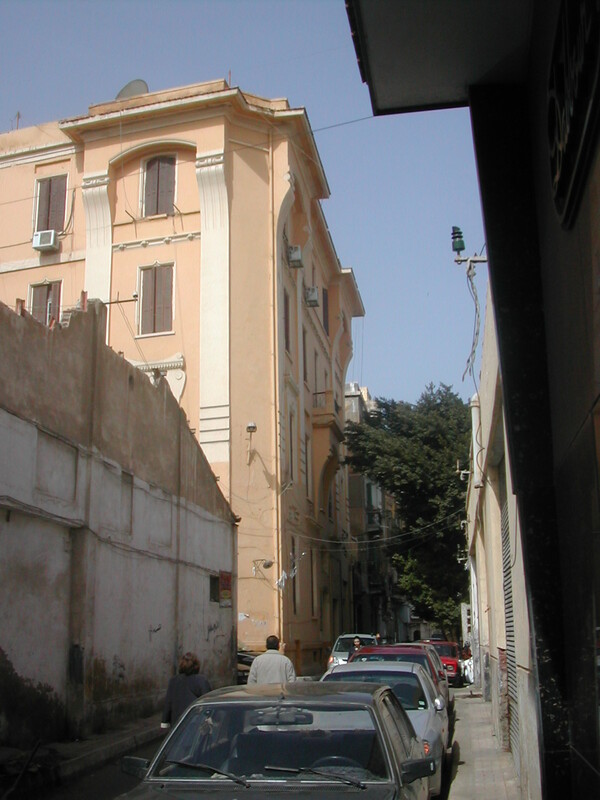 Alexandria, with a bit of renovation and a big paint job, would be resplendent in no time. Today is Mohammed's last day with us, which leaves me with a bittersweet feeling. We're getting more and more comfortable with each other. Will we ever see him again? But we won't think about that now. There are too many questions to ask him. 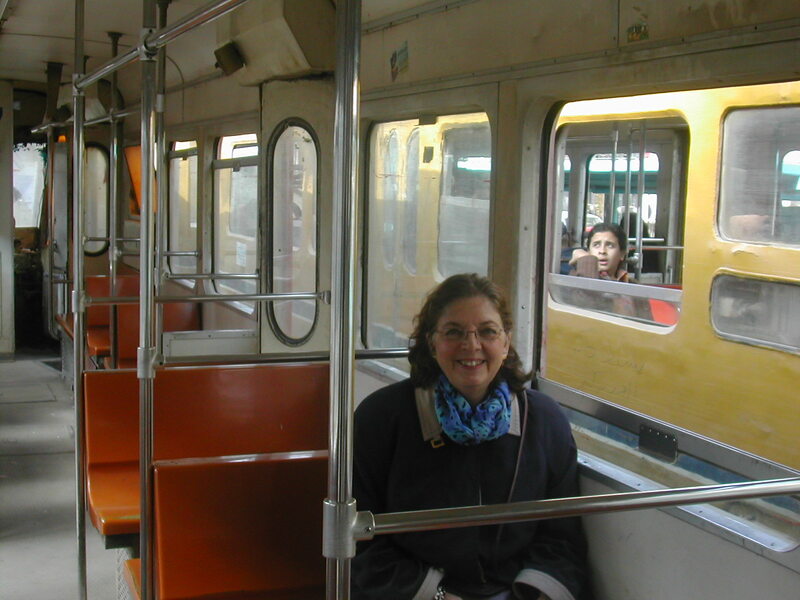 First on the agenda is to ride the tram. 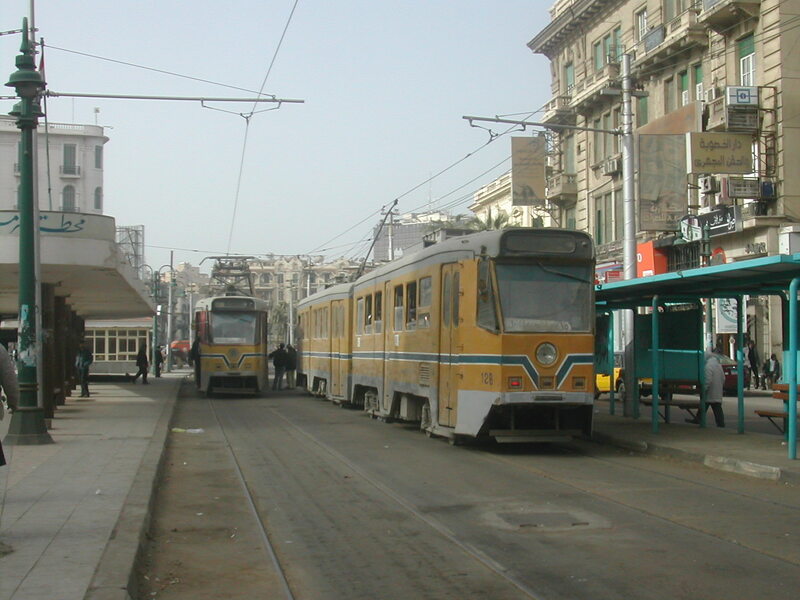 Peter has been reading about the tram, which featured in all the books and old chançons about Alexandria, and he wants to ride it, even if only for a few stops. Waiting for the tram, we see an old man walking along the tracks with a big plastic bag in his hands. He's picking up garbage! He must be doing it out of love for his city. Mohammed puts his hand on my arm, as he always does when he wants to point me to or clarify something. I look over to Peter as he explains. He's touching Peter's arm as well, with his other hand. "This building is from the turn of the century. See the nice archictectural devices with the brickwork. It's the same architect who built the building our hotel is in." I'm relieved that it's not only my arm which is being touched. It's nothing personal with him. Mohammed simply likes to touch the people he's talking to. I find that endearing. It even helps me listen better. I should have grown up in the Mediterranean culture. It would be so much easier to be the open person I am in that environment. The tram arrives and we climb aboard. 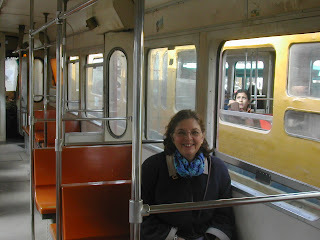 These must be the very same trams that people were riding sixty years ago! It appears that nothing has changed except for the effects of aging. Mohammed so obviously loves this city. The guide books are full of its more recent history. Monty's Bar, for example, at the Cecil Hotel, is where General Montgomery met with other British officers to plan the battle that ousted the Nazis out of Egypt. We had coffee last night in a café the poet Cavafy spent hours in. Thinking about the many traces of thousands of ghosts once living here, I ask Mohammed if he feels a sense of nostalgia when looking at the buildings. I'm thinking of all the expats who once populated this city. I've started reading a lively, amusing book I bought about the Alexandria of the 1930s and 1940s, Coctails and Camels, by Jacqueline Carol. Ms. Carol, like so many of the inhabitants of Alexandria in that day, is of Lebanese descent. She describes life among her privileged class of people. The Lebanese, French, Greeks, Jews and the English all lived in a world separate from the Egyptians, whom they used as their servants. Every summer the immigrants would all leave Alexandria, escaping to Europe, to get away from the thousands of Egyptians who came in hordes as soon as it got hot, taking over "their" beaches. "What does nostalgia mean?" Mohammed asks. "A longing for a time long past that can never come again." "Oh, yes! I feel such nostalgia for my childhood when I'm here," says Mohammed. "My family used to come here every summer when I was a child. I have many happy memories from those times." His idea of nostalgia is purely Egyptian, something completely different from that of the Westerners who left Alexandria en masse forever in the 1950s. don't degrade yourself with empty hopes like these. and say goodbye to her, to the Alexandria you are losing. 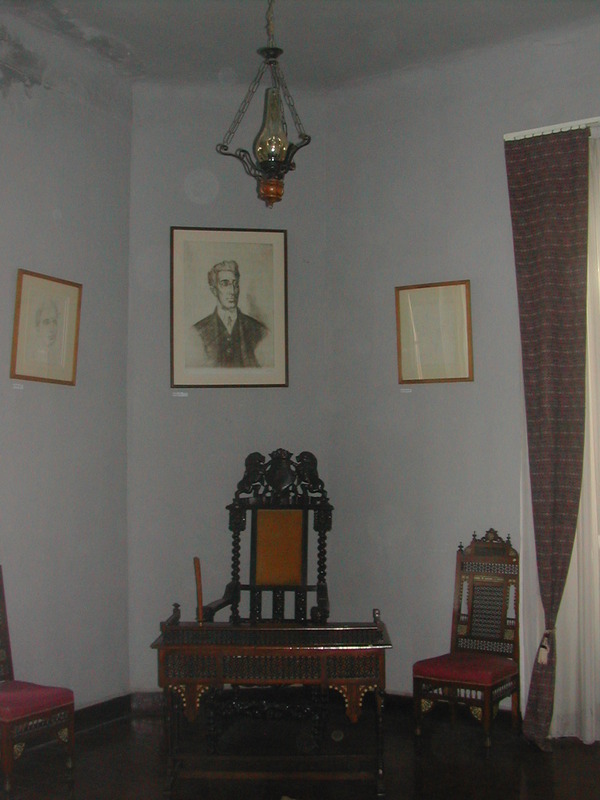 Cavafy's home is a roomy, elegant apartment occupying the entire floor of an apartment building. He obviously lived very comfortably, as do so many expats living abroad, as I did when our family lived in Brussels. While studying the letters in the display case and admiring the furniture, I hear a rooster crowing from outside. I look out the window - and am shocked. A large extended family lives in the sandy courtyard. There is no sign of any beds, or bathrooms, or a roof over the shed in the corner. There are only pieces of fabric and crates piled up, car parts, plastic bottles and garbage strewn about. Chickens, roosters and a goose are running around with people of all ages. How can people live like that? We leave to explore the more distant past. Coming from the States, I would say Cologne, where I live, is ancient, having been founded by the Romans. 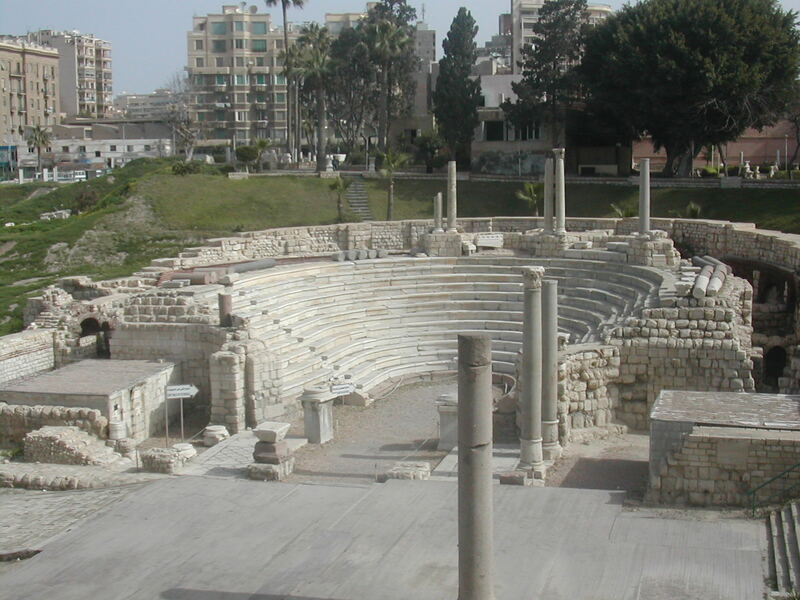 But Alexandria is even older than Cologne - it was founded by Alexander the Great - a Greek. In Egypt though, you can go even farther back, one of the cool things about this country. 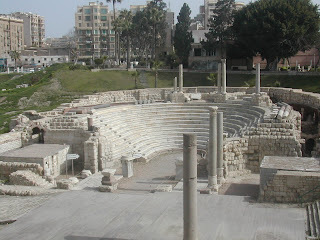 Compared to Luxor, for example, where the Pharaohs lived, Alexandria is young! Yet, it has Roman ruins worth looking at, and Peter would like to see them, so we drive to have a look at the amphitheater. It reminds me of Roman ruins I've seen in Germany and Italy. We then do the part I chose to do - we drive along the coast a while, until we find a fast food restaurant where we can have falafel. 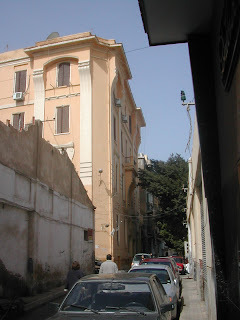 On the way, Mohammed tells us about a friend of his who lives in Alexandria. "She's twenty-seven," he says, "and her parents are getting nervous about her finding a husband. She and I took some courses together. She's highly educated, and it's hard for her to find a man she could imagine marrying. She's turned several down already, and now both she and her parents are getting a bit desperate about it." I feel sorry for her. Twenty-seven and over the hill already in her culture. During lunch, Mohammed talks on his cell phone to a few people, and then we drive to the other end of the bay to Fort Qaitbey, a stunning citadel built at the edge of the sea in the 1480s by Sultan Qaitbey - on the same site as a famous Pharos Lighthouse that is now considered one of the seven wonders of the ancient world. Divers are continually finding parts of the lighthouse under the water. The citadel forms an impressive backdrop against the sea. It once protected Egypt from invaders from overseas. If you gaze across the water, there is nothing but water. The nearest country is Turkey, hundreds of miles away. 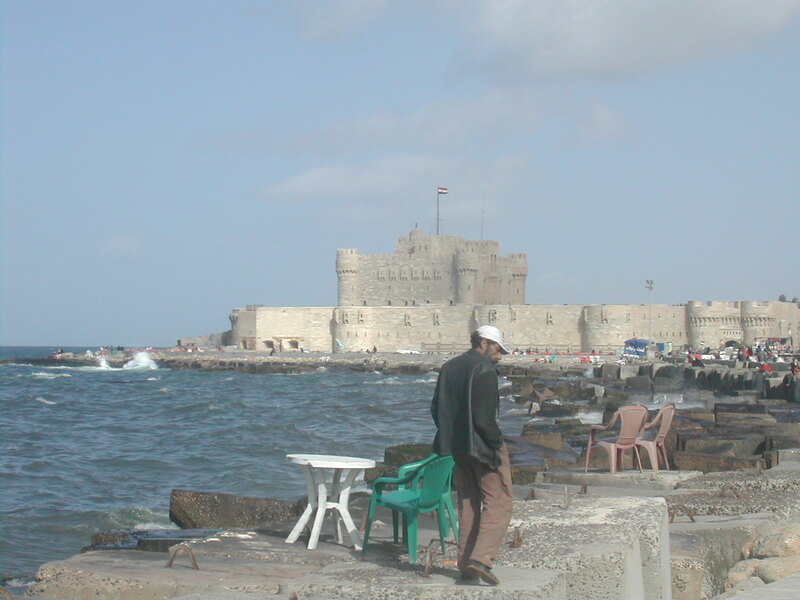 Fort Qaitbey. A stranger seems to be trying to pick up his mood. "My friend may join us at the citadel," Mohammed announces. There she is, waiting for us, as we arrive. "Let's leave them some time alone," says Peter to me, taking my arm as we walk away. I look over to them and see what he means. They are deep in conversation, and from the way they walk, it doesn't look like they're talking about archaeology. Peter and I enjoy the sound of water lapping the land and the absence of cars honking. The air smells clean here, of the sea. 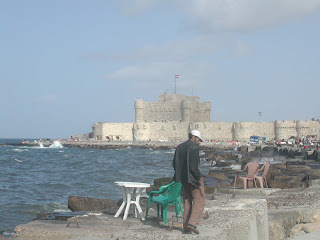 The sun is almost warm, but Alexandria is much cooler and windier than Cairo. After about a half hour, we return to Mohammed and his friend. "Do you like Mr. Mohammed as a man?" She has a knowing smile on her face. She's a woman. We both know this feeling. "Yes," I answer without hesitation. "And so do you, don't you?" I love this freedom to say what I think! Thank you for also being so frank. This is going to be interesting. And now we're exactly where I had hoped to go in this relationship. Mohammed is a nice man who finds me attractive, but I'm nothing special for him, and that is a relief. I don't want any complications, and I don't want any competition for Peter. She smiles and caresses Mohammed's arm for a second or two. "You know what I think?" I say to her. "Mohammed likes women, and that feels good to a woman." Looking at the two of them, I like the way they look together. She is really something. She's perfectly made up, and her clothes all match. I wish I could ask her how she does her eye makeup. But there's another question I want to ask more. "May I ask you a personal question?" I ask. "Could you imagine being a second wife to Mohammed?" She laughs. "No, he's too old." She gently strokes his cheek with her beautifully manicured fingers, a half-smile on her face. "You need a shave," she must be saying to him in Arabic. She turns back to me. "My parents would never allow it." So this is the one her heart is yearning for, I think, but do not say. It makes so much sense. They would make a very attractive couple. I think she could be happy with him. But would they be happy? What about his wife? Their children? I'm burning to know more. Thinking about all this, imagining Mohammed having her as a second wife, on one level, in this culture, it makes perfect sense to me. She can't find a suitable husband, and she needs to be married. So why not get married to Mohammed, since it's allowed? It's time to drive back to Cairo. As we leave Alexandria, we see young people picking up garbage from along the sides of the road. "Mohammed, can I ask you a personal question?" Silence for a moment. "Could you imagine taking your friend as a second wife?" I glance over at Peter. He's squirming in his seat, and has turned his face to the window. The marshy Lake Mariut must be fascinating. "Naw," he waves his hand. "Well, yes, I suppose so," he continues, "if I didn't have so many children and had more money." This sounds serious! But that's kind of how it looked to me out there. "What would your wife think, though? Do you think your wife would like it?" "Would your friend like sharing you with your wife?" "No, that would be another problem. But she's only a friend, anyway. She's got a fantastic sense of humor. Sometimes she calls me and we chat. She tells me her problems. I'm more like a father or an older brother for her." Perhaps, but more than that too. "No - you're more than that to her. I can see that." I think Mohammed is enjoying hearing my perspective on this friendship, and I'm enjoying giving it, even though my husband is slowly dying in the corner of the car. We talk now about all sorts of personal things - something one of his tourists predicted about his future career, about his effect on women. "But I like men, too," he protests. Yes, and that makes him all the more desirable to women. He genuinely likes people - all sorts of people. I think I know now why he asked us about Mormons the other day. I wish I could meet his wife. And his children. I feel sure I would like them. I hope, for everyone's sake, that Mohammed never makes enough money to marry his archaeologist friend. But that he makes plenty of money to support the family he has. I hope he can go to Alexandria and enjoy some occasional light-hearted flirting with his friend, staying in his role as older brother-father figure, until she finds a good, suitable husband. In fact, I've started praying for that. I don't want Mohammed's wife to have to live with jealousy or insecurity. I don't want Mohammed to have to live in poverty, pulled between two women he has to support. And I want the archaeologist to be able to find a good man and keep him all to herself. I can imagine God wanting this too, so I pray for this, trusting that I am praying in God's will. "Thy will be done," Jesus taught us to pray. This is one of the ways I pray for God to bless Egypt. A trickle at a time. Our driver drops Mohammed off. We don't get to meet his wife. We say farewell, and drive on to our hotel. Welcome to my blog. If you know me already somewhere in this planet, now we can share our thoughts with another, whether we live within shared meal-time distance or only virtually. If we've never met, this is the time and place. Here's to our start! I am a transplanted American woman who ended up back in Europe, but not where her ancestors started out. I am a hybrid, like most of us Americans, a mixture of Cornwall, England too, I suppose, Denmark and paprika from Hungary. I had German in high school for no other reason than that my dad had also studied German. I have no German ancestors, but ended up living here where I have spent over 20 years trying to make sense of what happended. I have also lived in Brussels, Belgium, and love traveling all over Europe. I am an American European, raised in Minnesota by evangelical Christians. I'm still trying to find my own place in God's Kingdom, constantly adding and discarding what I don't need anymore as I move through the ever-broadening landscape of that kingdom. I love life and am also scared of and scarred by it. I embrace the healing which is given to me by the King of that other domain I live in. I find much healing in words, so hopefully you can find a few helpful ones in my blog. In this blog, I explore my experiences, both the struggles and supreme moments as a pilgrim on an expat journey. Enjoy! A book I've published - "Betsy's Goodbye"